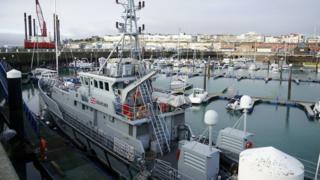 Eight migrants have been brought ashore at Dover after a small boat was seen heading to the UK. The Home Office said six men, who were with two young children, presented themselves as Iranian nationals. Their vessel was intercepted off the Kent coast by a Border Force cutter at about 04:00 BST. A government spokesman said: "Anyone crossing the Channel in a small boat is taking a huge risk with their life and the lives of their children." All eight had medical checks before they were passed to immigration officials. Two Border Force boats have been redeployed from overseas to patrol the Channel in response to migrant crossings. The Home Office said the UK had also agreed a joint action plan with France and increased activity at a joint intelligence centre in Calais. The spokesman said: "It is an established principle that those in need of protection should claim asylum in the first safe country they reach." Since January, more than 20 people who arrived illegally in the UK in small boats have been returned to Europe, he added.